Interior of the improved Lemery Municipal Health Center. A community health center in Batangas province’s Lemery municipality that caters to 46 villages with a total population of 93,157 and serves about 150 patients daily was recently improved by SM Foundation Inc. and turned over to local government and health officials. The now-improved Lemery Municipal Health Center offers Outpatient Benefit Package (OPB) and Tuberculosis-Directly Observed Treatment Strategy (TB-DOTS), as well as features an animal-bite treatment center. It also features a cold-chain storage room for vaccines and a medicine storage area, where medicines are arranged and displayed in cubicles so that pharmacists would easily identify the medicines that are receipted to patients after their diagnosis. These features are required by PhilHealth for the health center’s accreditation. Improvents to the health center also included a Felicidad Sy Wellness Center for Children and the Elderly; reception and waiting area; pre-natal and breastfeeding room; conference room; doctors’ rooms; consultation area; laboratory; TB-DOTS room; and a rest room for people with disabilities (PWD). The health center is the 34th improved by the SM Foundation. It sits on an 800-square-meter property donated by the International Bank of Rural Development in 1975. According to Leandro de Ramos, the health center’s public-health nurse for the last 12 years, upper respiratory diseases and diarrhea are the most common ailments treated there. 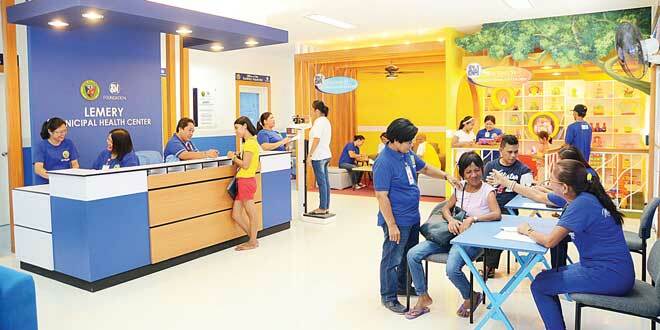 In serious cases, patients are referred to the provincial hospital in Barangay Palanos. The health center has a municipal health doctor and a dentist, who are complemented by two nurses and 10 midwives. Connie Angeles, senior vice president and executive director of the SM Foundation, formally turned over the fully equipped health center to Lemery Vice Mayor Simonette Rosales and the facility’s officer-in-charge Dr. Janice Umali-Kahulugan. Town councilors, barangay officials, and health officers witnessed the turnover. Also on hand to lend support to the foundation were members of the SM Group, led by John Jason Terenal, AVP of Mall Operation in SCMC South; Cid Luis Victoria, regional operations manager; Armie Andal of SM Store; and Lyn Gabriel, mall manager of SM Center Lemery. SM malls are tasked to periodically monitor the physical needs of health centers and all projects of the foundation within the vicinity of the malls. Like all SM Foundation-donated infrastructure, the maintenance of these donations are part and parcel of the memorandum of agreement between the foundation and the local government unit (LGU) handling the project.